This week’s Flannel Friday is inspired by the baby mouse/baby duck flannelboard that we all (or at least I do) love so much. I did an Australian Animals storytime theme this week, and I wanted a flannelboard to go with it. I originally thought about flannelizing the board book: Who Are You, Baby Kangaroo? by Stella Blackstone, but I decided that there were way too many pieces for that. So I made the mama kangaroo and the joey and just used them for this flannelboard. 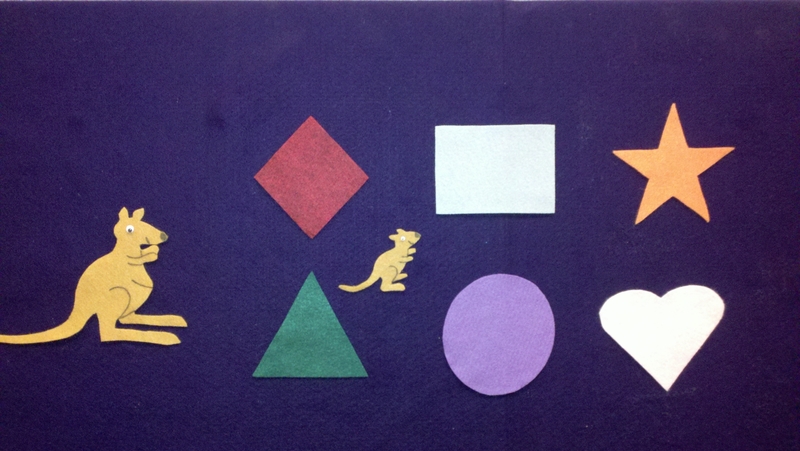 I had baby kangaroo hide behind different colored shapes so that I can use this for a colors or a shapes storytime as well, but I think I’m going to go ahead and make some Australian scenery and other baby Australian animals (baby koala, baby platypus, baby wombat!) to use with this flannelboard in the future. Anne at So Tomorrow is hosting the round up this week. And don’t forget to check out the Flannel Friday Pinterest or the Facebook Group! Get out of town! This is so adorable – great way to practice colors and shapes! Other baby animals and Australian features would be a lot of fun, too. Thanks for sharing!! Super adorable — will definitely be remembering this one! So simple, clever and perfect! I will be making all kinds of variations on this!